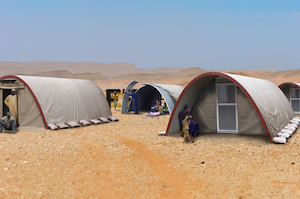 Lifeshelter® is a simple, sustainable and well-insulated shelter for rehousing projects around the world. Lifeshelter is a rehousing solution that will eliminate the use of tent-houses that are often discarded. The solution is based on an innovative patent pending concept that is ideal for rapid temporary rehousing in emergency situations, as well as being repurposed for permanent housing. The concept inspires housing construction methods that are an alternative to typical corrugated iron-sheeted roof structures that are ubiquitous throughout slums. By integrating local materials such as clay or lime-stone, it is possible to plaster the shelter to have a more permanent and solid structure. Too many shelter solutions consist of emergency tents or transitional housing materials that turn into waste after a relatively short life. Lifeshelters® are both economically and environmentally attractive as they can be reused for permanent housing.